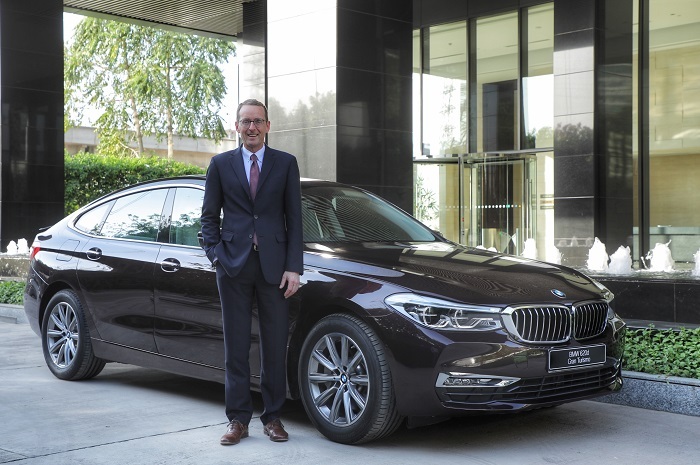 •The new entry-level two-litre four-cylinder diesel engine further diversifies the first-ever BMW 6 Series Gran Turismo engine portfolio. •BMW TwinPower Turbo technology featured in the BMW 620d Gran Turismo offers the greatest possible dynamic performance with the greatest possible efficiency. •Unique combination of aesthetic appeal, spaciousness of a coupe, long-distance comfort and dynamic performance. *Price prevailing at the time of invoicing will be applicable. Delivery will be made on ex-showroom. Ex-showroom price (inclusive of GST) (incl compensation cess) as applicable but excludes Road Tax, Tax collected at Source (TCS), GST on Tax collected at source, RTO statutory taxes/fees, other local tax/cess levies and insurance. Prices and options are subject to change without prior notice. For further information, please contact your local Authorized BMW Dealer. The range of fine upholstery combinations in the first-ever BMW 620d Gran Turismo Luxury Line has Leather 'Dakota' Canberra Beige exclusive stitching/piping in contrast | Canberra Beige, Leather 'Dakota' Cognac exclusive stitching/piping in contrast | Black and Leather 'Dakota' Ivory White exclusive stitching/piping in contrast | Black/Dark Coffee. The first-ever BMW 620d Gran Turismo features an accomplished balance of dynamic driver-orientation and luxurious comfort. Together with an elevated seat position and generously proportioned interior, it ensures first-class comfort. Thanks to clever use of space, the rear compartment provides three comfortable, full-sized seats with generous legroom and headroom. A relaxed and harmonious lounge atmosphere is created thanks to a two-part panorama glass roof, electrically operated adjustable rear seats along with electrically operated sunblinds for rear side. The Rear-Seat Entertainment Professional system guarantees great entertainment for the passengers with two 10.2' colour screens behind the front-seat backrests, a BluRay player, HDMI connection for mobiles, as well as various connections for MP3 players and game consoles. The Adaptive LED headlights, including BMW Selective Beam and cornering lights, provides an ideal illumination of the road. The iconic light design with four light elements makes the vehicle recognisable as a BMW even at night. Inside the Luxury Line, the aluminium door sill plates, sports leather steering wheel, exclusive colours for the ambient lighting and chrome edging for the air vents all catch the eye. Exclusive fine wood interior trim with highlight trim finisher Pearl Chrome further accentuates exclusivity. The innovative diesel engine from the BMW EfficientDynamics family offer considerably more spirited power delivery as well as spontaneous responsiveness even at low engine speeds. Thanks to the unrivalled BMW TwinPower Turbo technology, it blends maximum power with exemplary efficiency. The two-litre four-cylinder diesel engine of BMW 620d produces an output of 140 kW / 190 hp and a maximum torque of 400 Nm at 1,750 – 2,500 rpm. The car accelerates from 0-100 km / hr in just 7.9 seconds. The eight-speed Steptronic automatic transmission with Cruise Control performs smooth, almost imperceptible gear shifts. At any time, in any gear, the transmission collaborates perfectly with the engine, enabling it to develop its full power and efficiency. Overwhelming driving comfort of the first-ever BMW 6 Series Gran Turismo is a result of the BMW Driving Experience Control. It enables the driver to choose between different driving modes to suit diverse driving conditions - Sport, Comfort, Comfort +, Eco Pro and Adaptive. The adaptive 2-axle air suspension with automatic self-levelling not only provides supreme ride comfort but also sharpens the car’s dynamics. The first-ever BMW 6 Series Gran Turismo provides unparalleled performance with cutting-edge safety. BMW’s exemplary safety provides optimal support in any situation with six air bags, Anti-Lock Braking System (ABS) with brake assist, Dynamic Stability Control (DSC) including Dynamic Traction Control (DTC), Cornering Brake Control (CBC), Hill Descent Control (HDC), Side-impact Protection, Runflattyres (RFT) with reinforced sidewalls, electronic vehicle immobiliser, crash sensor and emergency spare wheel. With BMW EfficientDynamics, the first-ever BMW 6 Series Gran Turismo is equipped with the most comprehensive technology package to reduce fuel consumption and enhance performance. Aerodynamic excellence and accompanying reduction in fuel consumption is enhanced by host of measures such as active air flap control for BMW kidney grille, air curtains, air breathers and an automatically extending rear spoiler. Additional features such as 50:50 weight distribution, low centre of gravity, intelligent lightweight construction, automatic start/stop function, ECO PRO mode, brake energy regeneration, electric power steering and more, aid these measures. Every BMW pushes the frontiers of technology and innovation. The first-ever BMW 620d Gran Turismo impresses with game-changing technologies such as BMW Gesture Control, BMW Display Key and Welcome Light Carpet. The first-ever BMW 620d Gran Turismo is equipped with an extensive range of BMW ConnectedDrive systems like 8.8” digital instrument display with individual character design for Drive modes, BMW iDrive including touch controller, BMW Navigation Professional (with 10.25-inch touch screen), Apple CarPlay with wireless functionality, Rear View Camera with Park Distance Control, BMW Apps and Connectivity through Bluetooth and USB.